I have long considered soups as very versatile. They can be good starters. In a party, they set the tone for the kind of meal ahead. Likewise, they can also be the main event. Give me soup with a good, toasted slice of buttered French baguette, and I am good to go. You can have it any time of day. Put in a sourdough bread bowl, and you have a show. Like many dishes, I believe the best soups are the ones made from scratch. But we pressured cookers may not always have the luxury of time. And one cannot rush the cooking of good soup. It takes hours of simmering for the flavors to really get their act together. So what is one to do when you want good soup pronto? I found myself in this situation just last weekend. I was craving for creamy tomato soup. I had a pantry of limited ingredients. And time was even more limited. So I used what I had and used my instincts. To make a quick creamy tomato soup, I started out by sautéing 4 cloves of garlic, minced. I think one can use more to bring the flavor out faster. Just before they start browning, I added a bulb of chopped white onion. Then, I put in a can of tomatoes. I love canned tomatoes. They do come in very handy. You can have them any season. And although nothing beats the goodness of fresh tomatoes, well, there’s a practicality to their canned counterparts. They are very much packed with flavor, and can be your best assets as long as they are used correctly. And they’re easier to turn into soup. I just used a potato masher. To bring out the flavor of the tomatoes, I added beef cubes. This, I believe, would be the “secret” ingredient. I didn’t even put water anymore as this would dilute the flavor. Instead, I added milk — about a cup — to make it creamy. One can use cream, I suppose. But I find it too rich. To thicken the soup, I added Japanese bread crumbs. I then put cheese. I used vintage cheddar, which added an instant kick. Finally, I stirred in salt and pepper, chopped basil, and a drizzle of olive oil. The result: soup that tastes like it has been simmering in the pot for hours. But the truth, it only took 10 minutes. Can’t wait to have it with a grilled cheese sandwich next time. 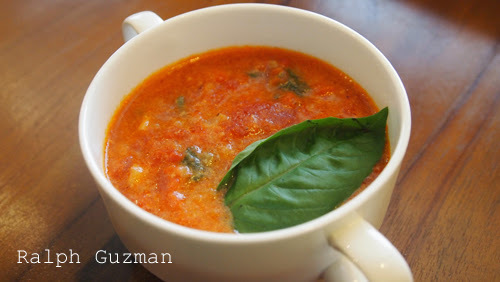 This entry was posted in Food + Recipes, Soup and tagged Creamy Tomato Soup Recipe, Easy Creamy Tomato Soup Recipe, Quick Creamy Tomato Soup Recipe, Quick Soup Recipe, Soup, Soup Recipe by Ralph. Bookmark the permalink.